The year and a half we have lived here, I´ve had several looks in my office. This is the room in our house that I spend most of my time, so it´s important that I like it here as well as being inspired. It´s nice to change the surroundings every now and then I think. This is how it looked like last fall. Last summer, when we first moved in. wow you success in one of my dream… first having the right place… close to daylight as well as with wall… and your change are just … so inspiring.. last one is my fav ! Bravo love your office! Jeg skjønner godt det må til forandringer på the office;) Du oppholder deg jo mye her i jobben, og da må man ha en kreativ plass og være…Super fine detaljer alltid hos deg, Nina;) Hadde kanskje blii kreativ jeg også her….og DIY hadde kommet naturlig for meg også? hehe…neppe! I love the first one a lot, but may be it looks a little bit messy. For me the last one is the best 🙂 Thank you for inspirations! Den siste er min favoritt:) Liker ALT med den stylingen! I really love all of the picures, but maybe the first two are the ones I’d choose. 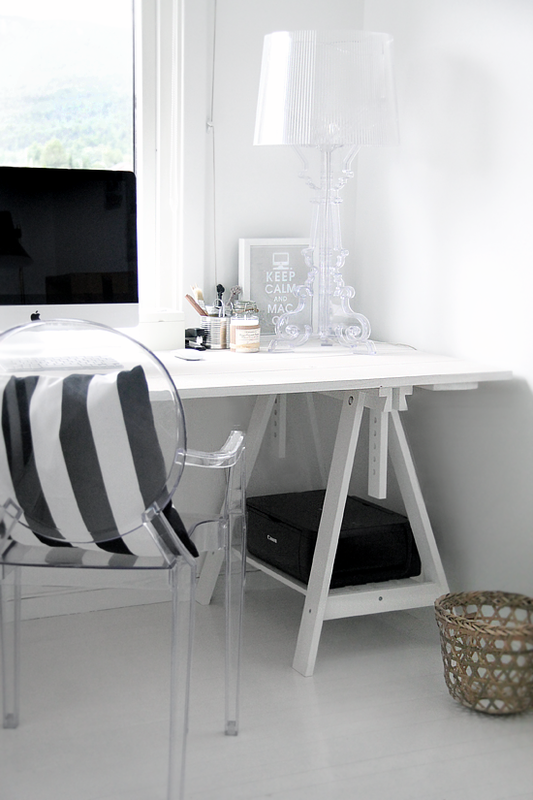 i like all the rooms, and yes – it’s nice inspiration! So nice! 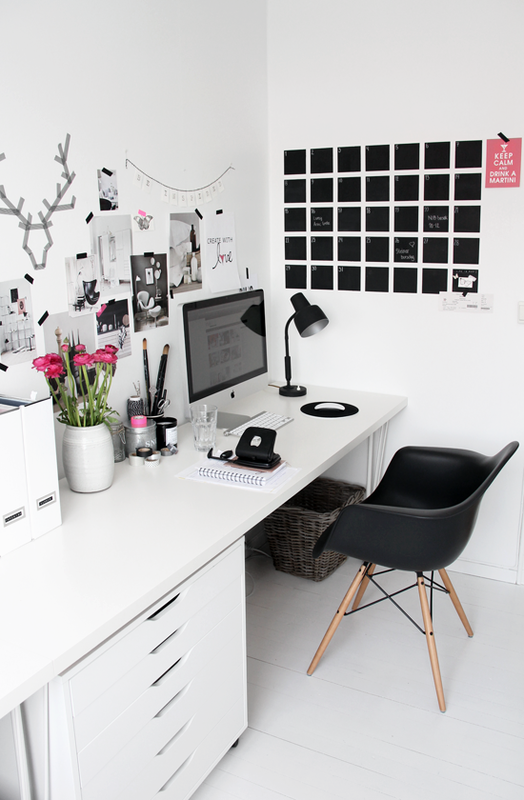 Gives me a lot of inspiration now when I’m planning to have my own office at home. Not very easy job because I have like four rooms in one. 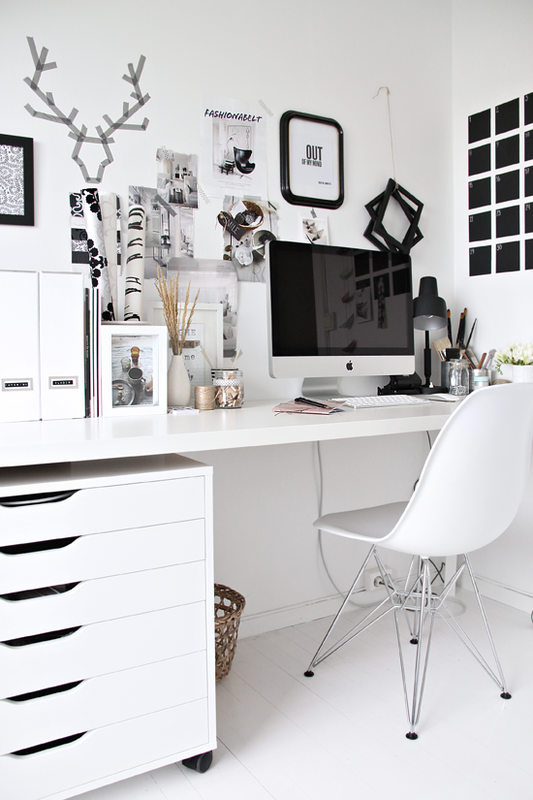 Bedroom, living room, kitchen and home office. 🙂 That’s why it’s extremely important to have a beautiful desk. my fav is no 3: love the clean atmosphere, and the combination of white-black-green highlights. Love all them all! 🙂 AND love your blog! I have a question for you: How do you get the cool watch as a screen saver (or front page?) 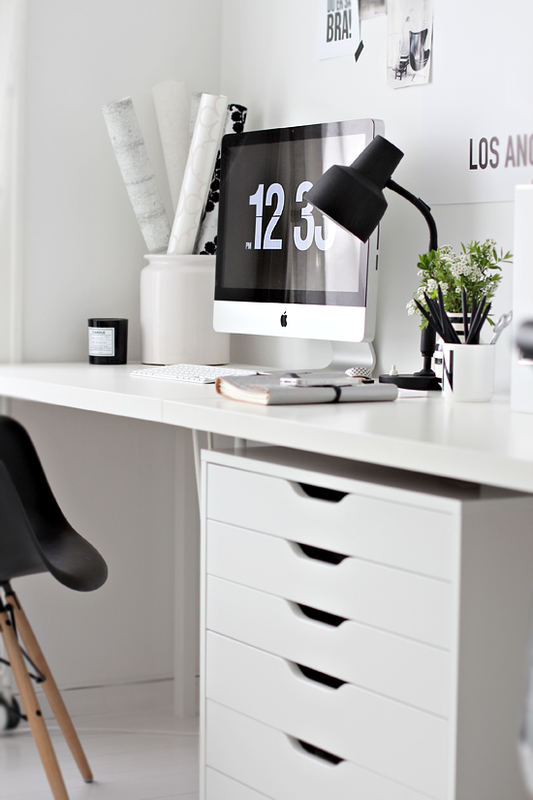 on your Imac? I just can`t figure it out… 😉 Please help me! Det kontoret må gi arbeidslyst ja…. 🙂 Hvilken farge har du brukt? Er det dempet sort? Ja sort dempet ser jeg at du har svart en annen her…. 🙂 Men et lite spørsmål til ang. pure color. Får du ikke fort striper og merker på veggen når den er så matt. I love them all, the two last are my favorits but just as Jane how do you do the watch on the computer??? Tror jeg likte april/mai best. Med tanke på arbeidsplass ved vinduet, men mot vegg. Nr. 2 var superlekkert! Inspirerende var de alle. Så stilig!! Greier ikke velge jeg – likte alle så godt! I love all of this, but like the first ones more! Do you mind sharing where you got the set of draws from in image 1,3 and 4? The set of drawers are from Ikea. These are beautiful inspirations I love them all!! I was wondering what camera do you use to take these pictures and how do you get them so clear and white?? Love them all! Which chair was the comfiest for working in?! 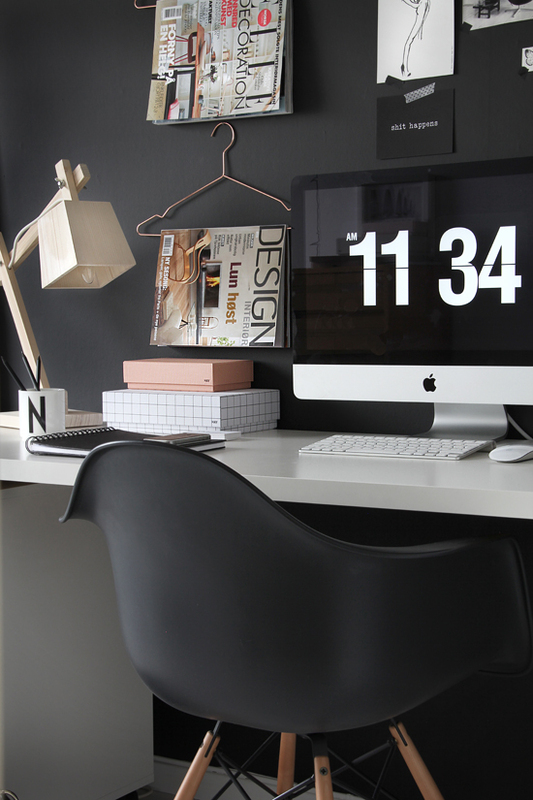 5 MINIMALIST HOME OFFICE WORKSPACE PRODUCTIVITY BOOSTING TIPS - Hey, Djangles.